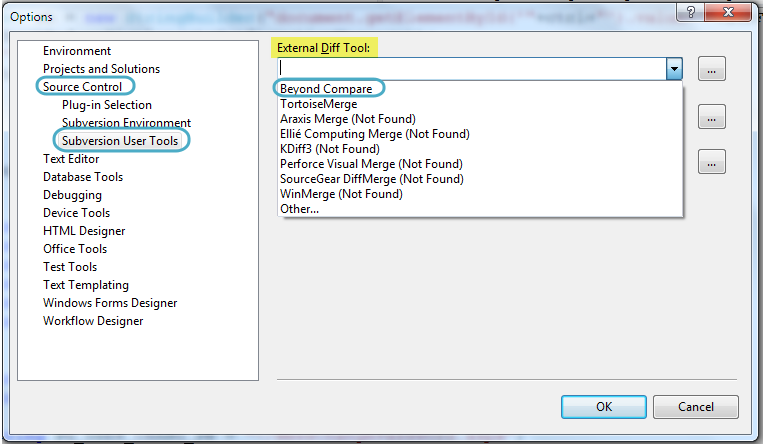 I would like to configure Visual Studio to open Beyond Compare by default as the diff tool. How can I do this? 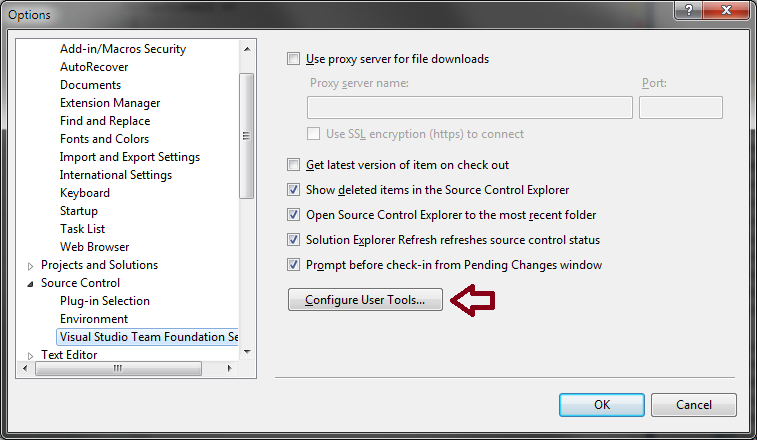 In Visual Studio, go to the Tools menu, select Options, expand Source Control, (In a TFS environment, click Visual Studio Team Foundation Server), and click on the Configure User Tools button. If you run Beyond Compare in tabbed mode, it can get confused when you diff or merge more than one set of files at a time from Visual Studio. To fix this, you can add the argument /solo to the end of the arguments; this ensures each comparison opens in a new window, working around the issue with tabs. If you're using GIT as your source code management system instead of the (fairly dated) TFVC then Visual Studio doesn't have options to configure anything like this. Instead it (rightly in my opinion) uses the GIT config file's setting. So if you already have GIT setup to use Beyond Compare or any other third party comparison software it will just pick this up and start using it. Select Plug-In Settings under the Source Control branch of the left-side tree control. Select Microsoft Git Provider under Plug-In Settings on the right-hand pane. Edit the global git config file (location is OS specific for windows it's %HOMEDRIVE%%HOMEPATH%/.gitconfig. See here for info) OR if you want it to be repo specifict then after starting a project in a Git repository, edit the config file in the .git folder in the project folder. cmd = \"C:\\Program Files (x86)\\Beyond Compare 4\\BComp.exe\" \"$LOCAL\" \"$REMOTE\"
cmd = \"C:\\Program Files (x86)\\Beyond Compare 4\\BComp.exe\" \"$REMOTE\" \"$LOCAL\" \"$BASE\" \"$MERGED\"
cmd = \"C:\\Program Files\\Beyond Compare 4\\BCompare.exe\" \"$LOCAL\" \"$REMOTE\"
cmd = \"C:\\Program Files\\Beyond Compare 4\\BCompare.exe\" \"$REMOTE\" \"$LOCAL\" \"$BASE\" \"$MERGED\"
Issues: If you create a new project and get VS to create the git repo at the same time it WILL add a load of overrides to the .git/config file forcing it to use Visual Studio again (Thanks for that MS!). SO either create the git repo via another means after the project has been setup (like via SourceTree or the command line etc...) OR edit the .git/config file (in the solution folder) and remove any overrides for the above settings. Thanks to minnow in the comments for bringing my attention to it again. Note: I keep coming across this but I am using VS with GIT and the answers aren't correct and although some of the comments mention a URL with the correct answer it's not clear and if I kept missing it I'm sure others will so hopefully this will solve that issue. $diffToolsKey = Join-Path $item.PSPath "$sccProvider\SourceControl\DiffTools"
Works on my machine. YMMV. No warranties, no refunds. VS doesn't appear to cache the key, so takes effect immediately. BComp.exe works in multiple-tabbed scenario as well, so there is no need to add /solo unless you really want separate windows for each file comparison. Tested/verified on Beyond Compare 3 and 4. Moral: use BComp.exe, not BCompare.exe, for VS external compare tool configuration. The answer posted by @schellack is perfect for most scenarios, but I wanted Beyond Compare to simulate the '2 Way merge with a result panel' view that Visual Studio uses in its own merge window. This config hides the middle panel (which is unused in most cases AFAIK). The link above worked for me with the "GITHUB FOR WINDOWS" instructions. I use BC3 for my git diff, but I'd also add vscode to the list of useful git diff tools. Some users prefer vscode over vs ide experience. git config --global difftool.vscode.cmd "code --wait --diff $LOCAL $REMOTE"
Not the answer you're looking for? Browse other questions tagged visual-studio beyondcompare or ask your own question. How to configure Visual Studio to use Beyond compare for TFS GIT? Can I use WinMerge as my merge/diff tool within Visual Studio? Visual Studio 2015, code review, and custom compare/merge tool, is there a way to make all of this work? Visual Studio 2017 - How to ignore whitespace while performing merge operations?